​Here is a summary of the rules; it is your responsibility to know “all” the rules of any playing circuit that you officiate. 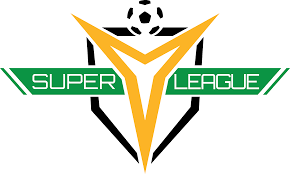 ​All players AND Staff must be registered through Sport Engine and have a valid, laminated SYL player pass to participate in a match. 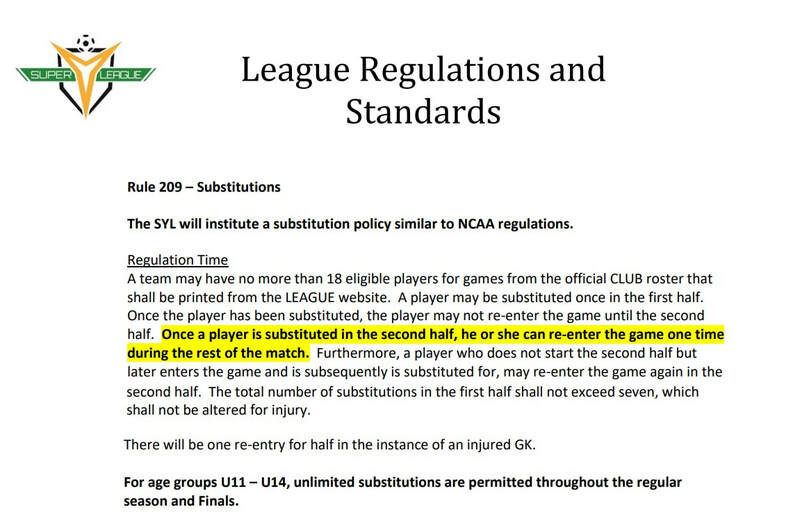 All Referees must have a current USSF Referee License. 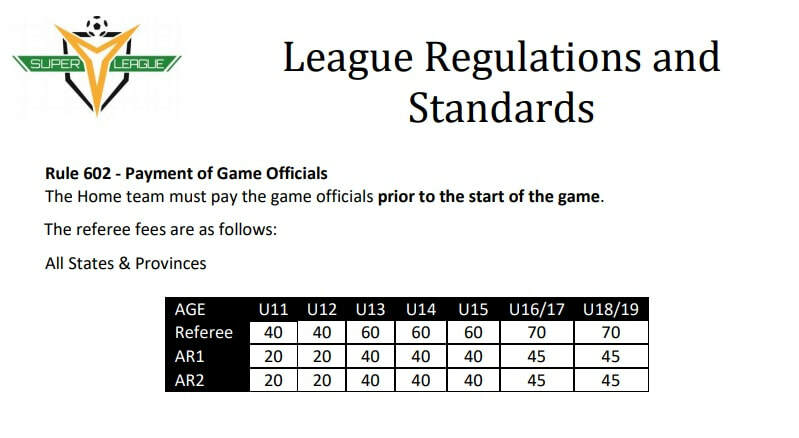 The three (3) Referee System (diagonal system) shall be used for all games. The two (2) WHISTLE Referee System is prohibited. If there is only one or two referees present, a club linesman may be appointed by and at the Referee’s discretion as a replacement. Club linesman is only permitted to indicate when the ball has left the playing field and is NOT to indicate direction of the restart. Each team is required to provide a scorekeeper and we should fully utilize them for keeping track of the substitutions. Collect the 11 starter's ID Cards, once they are substituted no re-entry in the 1st half. Collect ID card of each substitute before they enter the field. If they are substituted in the 1st, no re-entry. Collect the 11 starter's ID Cards, once they are substituted they are allowed one re-entry. When a player re-enters write their number in your wallet. Collect ID card of the substitute before they enter the field. If the player is substituted and later re-enters write their number in your wallet. Players that you have written down in your wallet are not permitted to re-enter a 2nd time. ​The Referee is required to report on the Official Match Report all instances of misconduct. 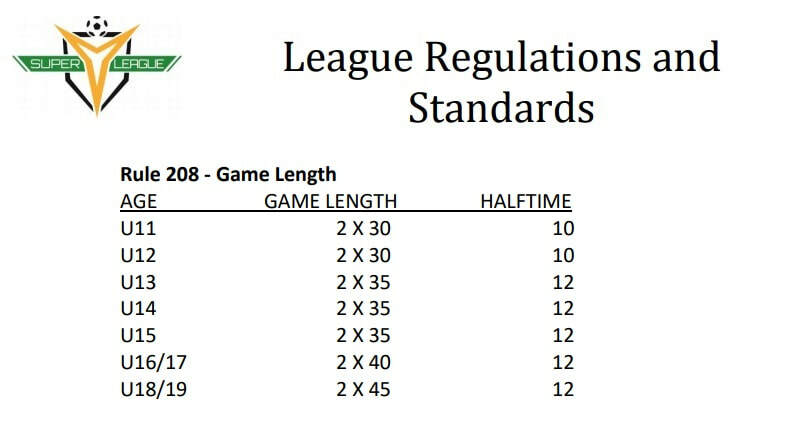 It is your responsibility to check the OFFICIAL LEAGUE SCHEDULE, before leaving for your games. ​Before you click on SUBMIT take a snap shot of your availability for your records.